The home shown here is built out of three 20′ foot shipping containers. It’s designed with a natural air circulation system and many other features to maximize the comforts and space. It has two bedrooms with separate sitting, dining and kitchen area. The bathroom is fitted with quality bathroom fittings, hot water and a granite top vanity with mirror. Floors are timber tiles and vinyl carpet. Walls and ceilings are fully insulated and plasterboard lined to give a smooth, quality finish. According to the builder’s site, this home cost $USD 35,000 in situ. 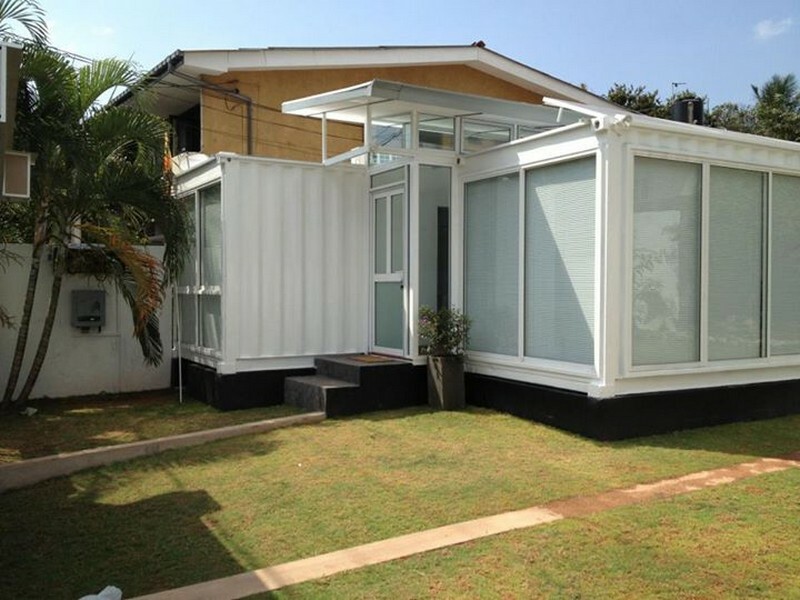 Obviously, labour costs are a lot less in Sri Lanka than most western countries, but container homes are ideal DIY projects so only you know the value of your own time. Containers as a unit are priced pretty much the same around the world as are general material costs so the difference is the labour component. 1. 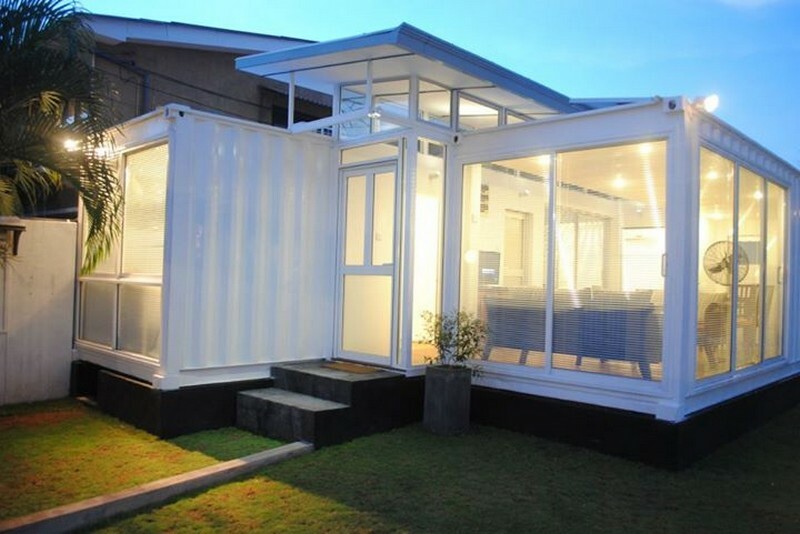 Hybrid homes are made from containers. How would you control corrosion? A shipping container is a special, non-corrosive Corten steel; then, when coated with the marine paint, it becomes virtually rust proof and also prevents fungi, mold and is highly antiseptic. 2. Sri Lanka being a tropical country close to the equator, is very hot and humid. How would a hybrid house made from containers control the temperature? The exterior of the container is painted with Marine paint which reflects the sunlight and keeps the heat to a minimum level. Also a 50mm thick insulation foam is fixed to the internal panel which is further covered with gypsum board. The insulation increases the thermal efficiency and ensures a temperature below 28c. Moreover containers have ventilation points. These are also being effectively used to reduce the heat within the container. 3. How could the hybrid house be protected from lightning and thunder? During lighting containers act as a faraday cage by distributing the electrostatic charges around the exterior of the house structure. As a result there will be no harm on the people living inside the house. Protection is more than a conventional house since the whole structure is double earthed. 4. What is the durability of the house? Containers have the strongest structure compared to wood, concrete or normal steel buildings and also it has a shelf life ofover 20 years in the sea. Therefore it is guaranteed that a hybrid home will last for more than 20 years provided that proper maintenance is carried out. 5. Why do you say it is an eco-friendly house? The core material used for Hybrid Homes which is a container, itself is made out of 85% recycled steel, and is fully recyclable if demolished. Also other materials such as Gypsum Boards, GI pipes, Wood Composite panels and vinyl carpets which are used in building the Hybrid Homes are all recyclable material. Hybrid Homes also have option to add solar power and rain water preservation. 6. How will the house be protected from termites? The house is completely termite free because the structure of the house is made out of steel and the interior cladding is done using gypsum boards which are resistant to termite attacks. 7. How many floors higher can it be built? The hybrid home designs can be made up to 3 floors high without reinforcement and 6 floors higher with reinforcement. As we all know in a cargo vessel containers are stacked up to 6 levels with cargo inside. 8. How can you move the house? First the house will have to be de assembled into movable parts and transported to the required location using proper utility vehicles or if there is no proper access to the land by road we can provide the facilities to air lift it. 9. Why does it take less time to construct? It takes less time to construct because we use the container itself for the structure of the house and it is just the matter of adding the additional components to make it a complete house. Also our team of expert employees have been in this business for over a decade and are highly professional and experienced. 10. How safe is it against theft? Hybrid homes functions just as any other conventional house. However it is much safer than a normal house. The walls of the house are entirely made out of steel and a thief cannot break through it unless he tries to cut the wall which requires heavy machinery. The glasses used for Hybrid Houses are stronger than the glass panels that you find in many wooden windows. If the client requires more safety through the windows we are able to fix grills as well. 11. Can it be insured? Yes the house can be insured just as a normal conventional house. 12. What about the foundation of the house? There is no need to spend a large sum of money on putting the foundation like it is done for a conventional house since it only requires four corner posts to anchor a container. 13. Does it require any approval from the municipal authorities? Under the Sri Lankan current laws and regulations Hybrid Homes are considered as semi-permanent houses. Therefore there is no need to obtain any municipal authority to build a Hybrid Home in your land. The video link below may be valuable but it is in Sinhalese so we are unable to comment. Did you miss seeing Manifesto House – up in 90 days with 175 m2 of quality living space using containers and waste pallets!